A number of new masks have been unveiled for the 2016-17 season, so let’s check out what we’ve seen so far from Eastern Conference goaltenders. Keep checking back, as we’ll continue to break down more masks as they’re revealed, and while you’re at it, check out the Western Conference masks. 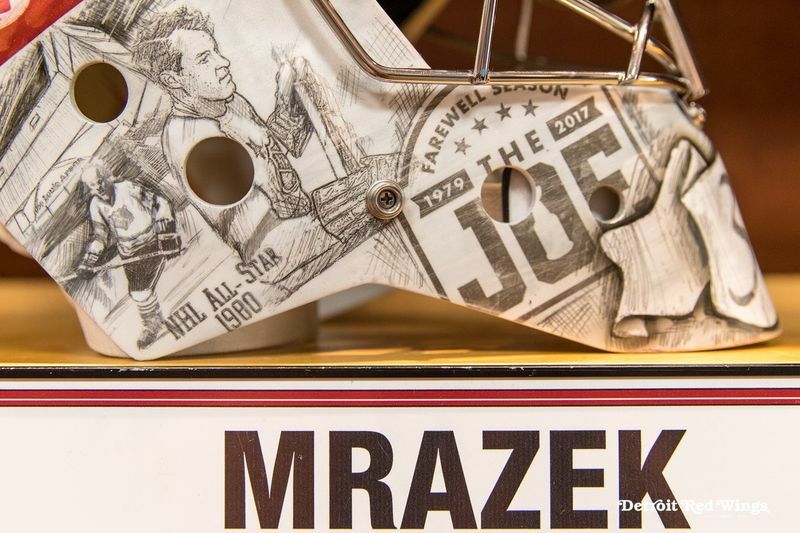 For the Red Wings’ final season at Joe Louis Arena, Dave Gunnarsson created the ultimate tribute to the arena and team’s storied past in Petr Mrazek’s mask. Gunnarsson drew input from Mrazek himself as well as members of the Red Wings team staff to come up with a design worthy of the Joe’s history. Using a sketch pen technique, Gunnarsson gave this mask an artful, history book aesthetic. The top of the mask keeps things clean and simple with a candy apple red backdrop and off-white Red Wings logos. Underneath, the black and white illustrations feature Detroit legends including Gordie Howe in his final All-Star game appearance and Steve Yzerman at the 1983 draft. Surrounding the legends are illustrations of the arena itself and the farewell season logo. 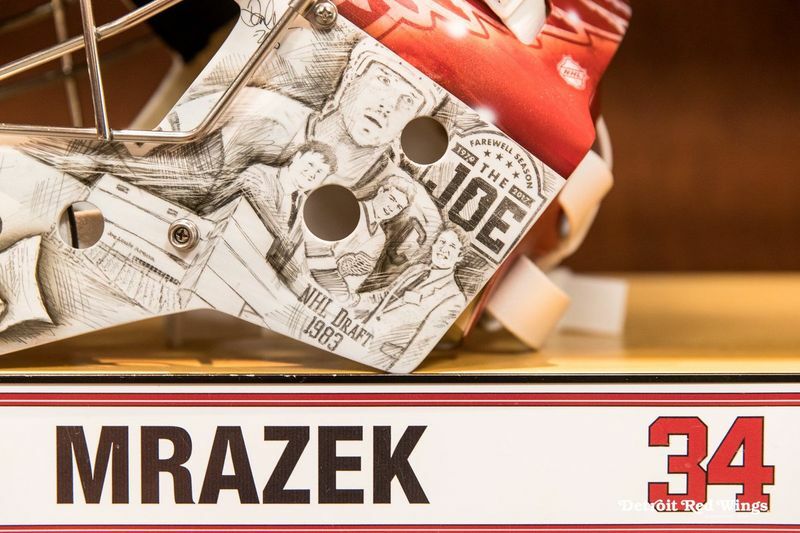 To keep things from getting too sentimental, Mrazek’s usual cartoon style (we all saw that World Cup mask) makes its way in on the backplate in the form of a little puppy. Why? Well, it’s a puppy, so why not? Rounding out the pair of tribute masks to the Joe is Jimmy Howard’s history-laden design from Detroit-based artist Ray Bishop. 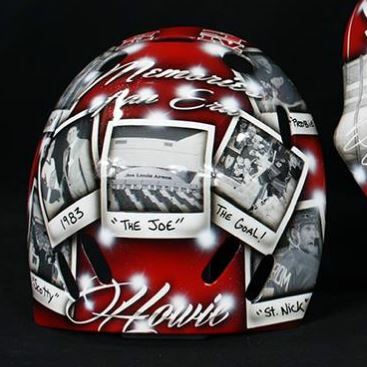 Like Mrazek, Howie boasts a who’s who of Red Wings legends all throughout his bucket. A soft, black and gray portrait of Mr. Hockey appears on the left side of the mask opposite Steve Yzerman hoisting the cup on the right. The legends’ signatures subtly appear over the portraits with their numbers boldly displayed behind them. 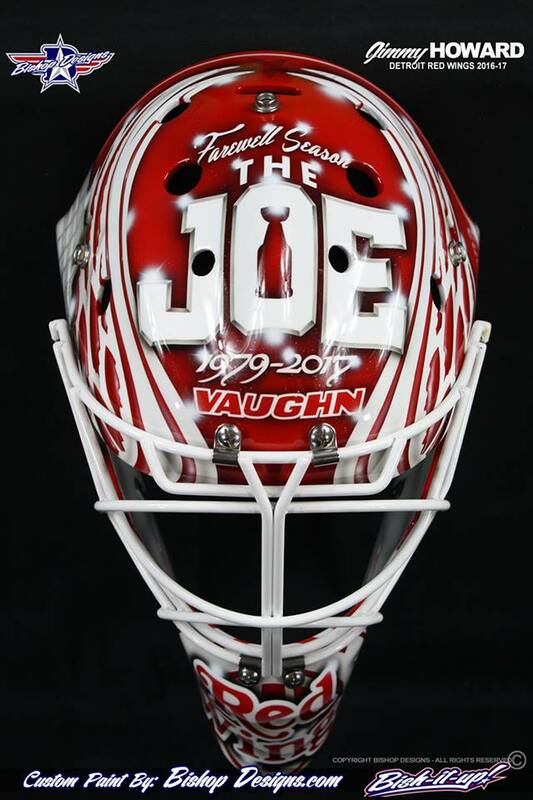 Two wings frame “The Joe” prominently on the top of the mask with the dates and “Farewell Season” around it. The back of this mask might be my favorite part with Polaroid snapshots under the words “memories of an era,” a truly impressive testament to the building’s storied history. Both Mrazek and Howard’s masks are really tasteful and powerful tributes to one of the league’s most beloved franchises. Taking a patriotic and simplistic approach, artist David Leroux created this crisp design for ‘Lumbus netminder, Curtis McElhinney. Every design element is derived from the Blue Jackets logo, making it the sole focus of the composition. 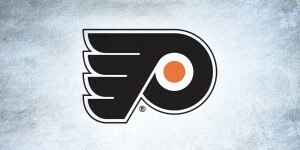 The full logo is depicted on the top of the mask with the red and white striped banner spanning down each side. the stripes meet in the star-spangled, blue and white area on the chin complete with a red circle from the Jackets’ logo. Like in all of his work, Leroux’s precision in his painting really shines here. The crisp lines and bevel and chrome effects are really sharp, so another job well done. It’s a bit of a shame to see Freddie abandon the playful, Lego character style that had become a sort of signature, but now a man of 26 years, maybe the fresh start in a new city with a new number one role is Andersen’s big step into true hockey adulthood. 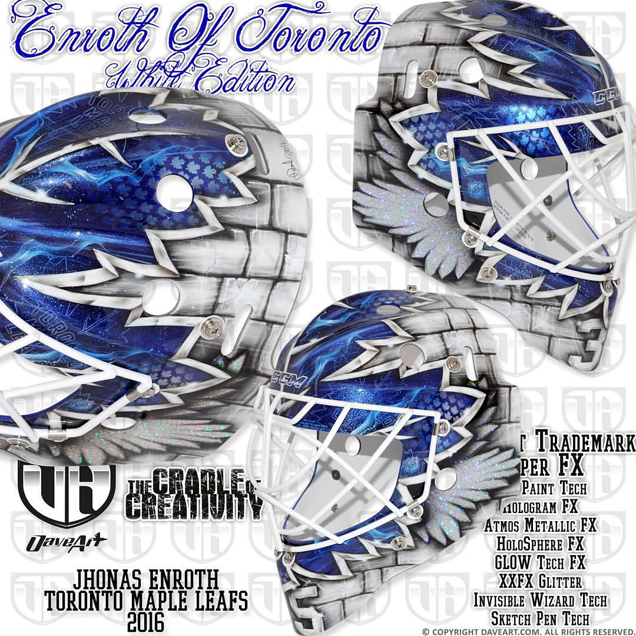 By Dave Gunnarsson standards (I suppose when you paint as many masks as he does, you can have your own set of standards), Jhonas Enroth’s first Toronto bucket is actually pretty simple. Jam packed with special effects? 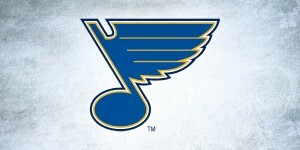 Absolutely, but the design concept is relatively bare bones. 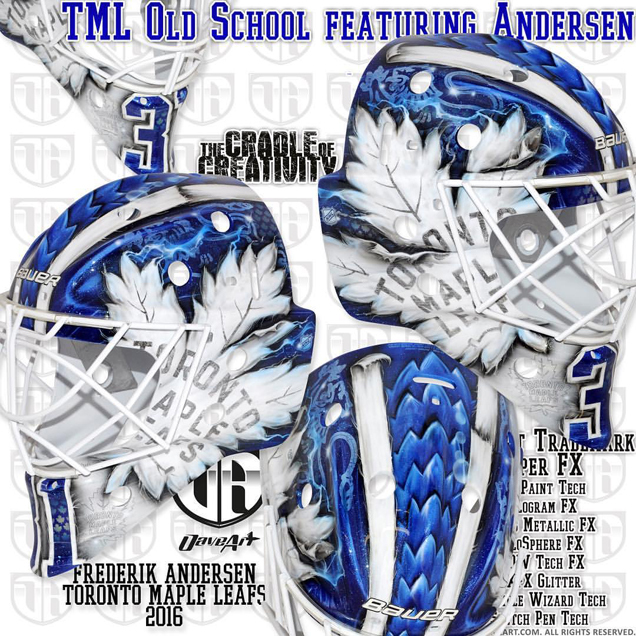 The primary focus is on the large, blue maple leaf that covers the majority of the mask. Within that leaf are layers upon layers of holograms, light flares, sketch outlines and whatever other special effects fit in the kitchen sink to fill in the vast blue field. Tiny leaves and outlines of Toronto’s logo create dimension in an otherwise somewhat dead space on the mask. Behind the leaf on each side are smaller leaves filled with… GLITTER. Henrik Lundqvist is also a big fan of this glitter decal treatment on his masks, so all I can assume is that they’re both making a case to play in Vegas next season. Piggybacking off his NYPD mask from late last season, Raanta and Gunnarsson continued to pay homage to New York’s finest with a new bucket this season. 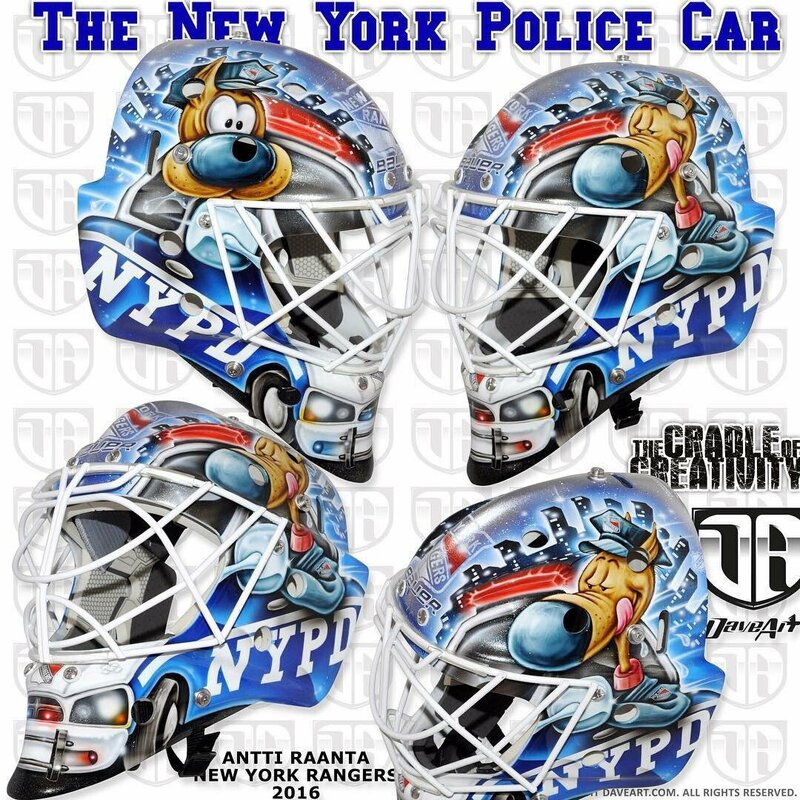 Following almost the exact same composition, Gunnarsson interpreted the NYPD tribute into a new mask for the New York Fire Department. 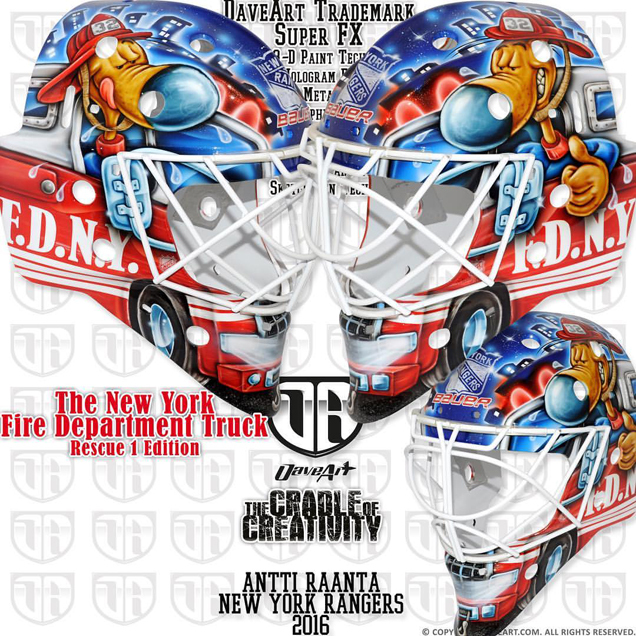 Like the NYPD mask, Raanta’s canine alter ego is seen driving the fire engine with the netminder’s number 32 on his helmet and Rangers logo subtly in the center. While (obviously) not a New York native, it’s great to see Raanta pay tribute to the men and women who protect his team’s city in such a fun and creative manner. 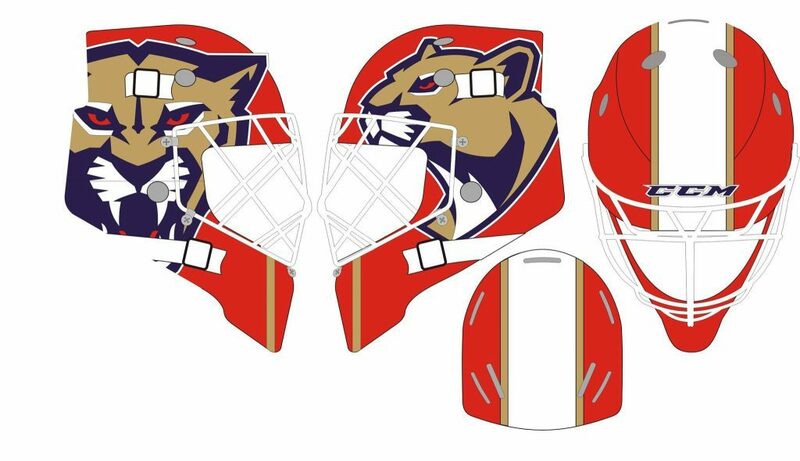 With a new logo and new jersey this season also comes a new mask for Florida netminder, Roberto Luongo. Painted by Stephane Bergeron, Lu’s new bucket showcases the Panthers’ old and new logos prominently on each side. Having played with the Panthers perhaps longer than any of his teammates, Lu embraces the aesthetic change. “It feels different,” he admitted, “but I like the way it looks.” The style of this mask is really clean and will coordinate nicely with the modern look of the new jerseys. 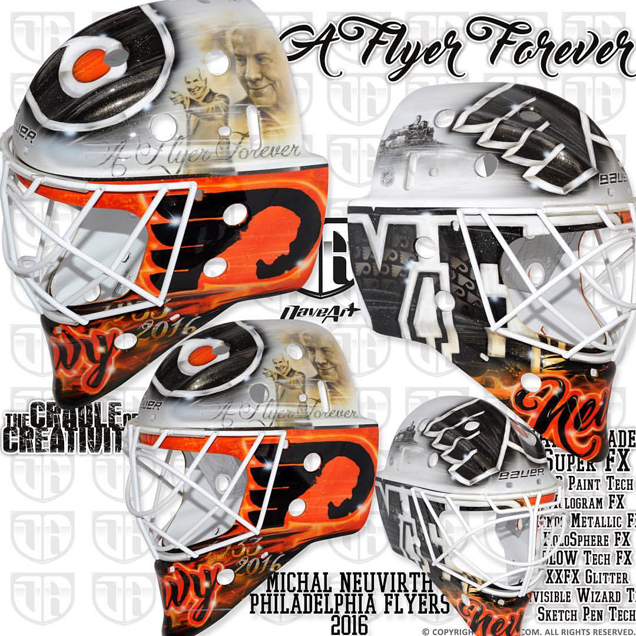 Tribute masks have been popping up all around the league this season, and Michal Neuvirth is the latest to board the train, paying homage to Flyers’ founder Ed Snider. The franchise icon passed away last season, and Neuvirth took advantage of the opportunity to honor his impact on the team. There are multiple styles of painting going on in this mask, from the hyper-realistic portrait work on the top to the graffiti-style lettering on the chin and everything in between. The sentimental elements that Neuvirth and Gunnarsson worked in are a nice tribute to Snider’s legacy, but unfortunately the design as a whole falls short aesthetically. 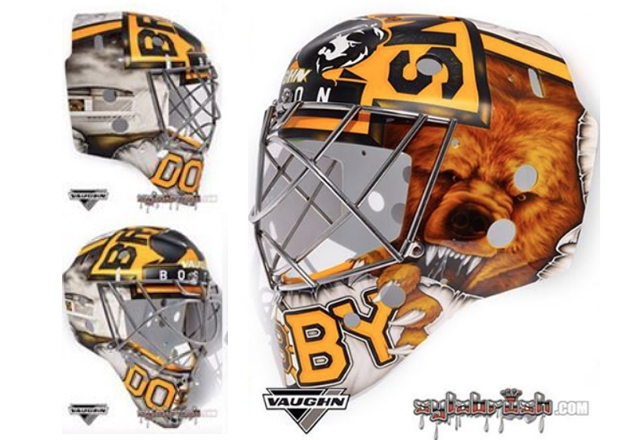 Returning to the Bruins this season, Dobby is back with another bear mask by artist Sylvie Marsolais. 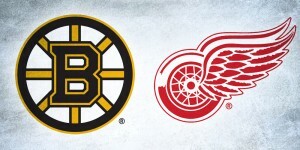 This design screams Boston in every way possible from top to bottom. The coolest part of this mask hands down however is the color-changing paint on the chin. Marsolais’ SubZero paint transitions from light to dark (you know, like those glasses except cooler) when hit with hot or cold water, which should be especially fun for a game played on ice where goalies regularly spray themselves in the faces with their water bottles. Particularly with the gold cage, this mask is really polished and screams Boston through and through. Overall, a job well done for Dobby and Marsolais. 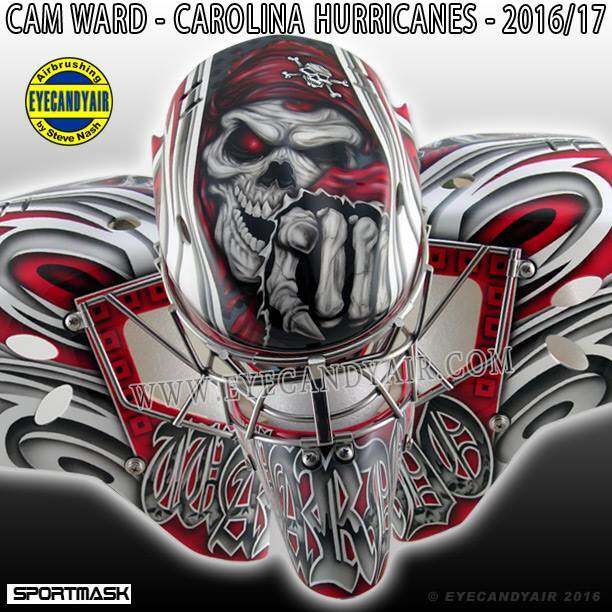 Bouncing back from a shortened season due to concussion, Cam Ward is ready and back with a new mask and a fresh start. Not straying far from his signature pirate theme, Steve Nash created the next iteration using a texture-filled skeleton pirate, Carolina logos and hurricane flags bordering the face. 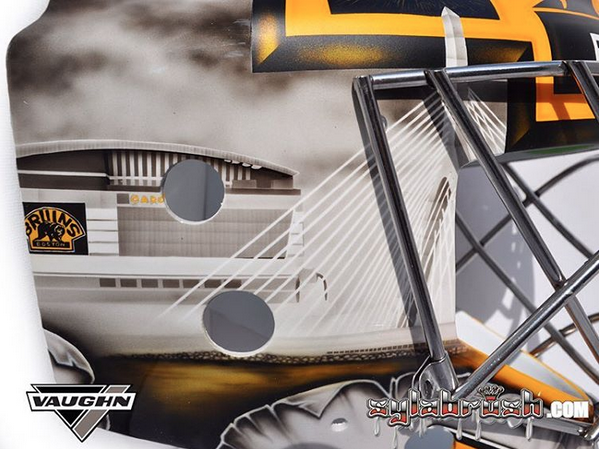 Full color and black and gray logos fill each side of the mask, almost creating a pattern of their own. Nash’s artistry really shines in the pirate skeleton though, as the textures and depth created in the wrinkles are really impressive. Overall, this isn’t much different from what we’ve seen of Ward in the past, but a solid mask none the less. 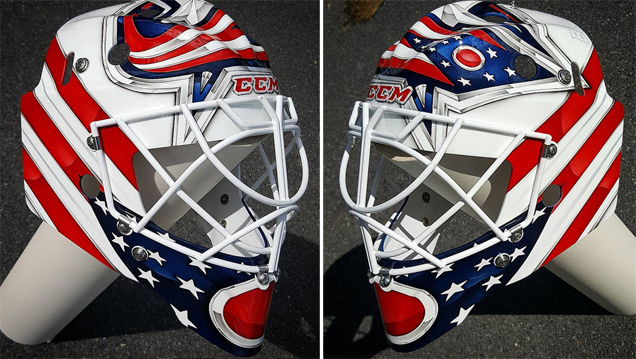 Mac’s mask isn’t so much patriotic in that it’s using the Ohio flag…which is also used in the Columbus logo. Mac is also Canadian.